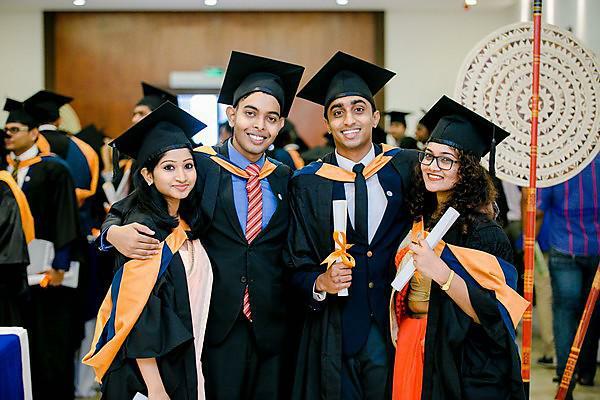 More than 1,200 University of Plymouth students graduated during a packed November in which the University hosted ceremonies in London, China, Singapore, and Sri Lanka. In the space of 12 days, the graduation team travelled 30,000 kilometres to stage eight events, which also included several alumni networking sessions. After an alumni event in Beijing kicked things off, nearly 250 Plymouth students at the University of Hong Kong SPACE graduated in the first of the overseas ceremonies. It also saw the award of an Honorary Doctorate of Education to Professor Edward Chen Kwan-yiu, for his contribution to education in Hong Kong, and to the teaching of economics around the world. Three days later, the team held an alumni event in Singapore and conferred an Honorary Doctorate of Business on Roland Tan Keng Hock, for his work in championing maritime education, to celebrate the partnership with the Singapore Maritime Academy. Just 48 hours later, the team was in Sri Lanka for the inaugural graduation ceremony for Plymouth students at the National School of Business Management. More than 100 students were present, and an Honorary Doctorate of Business conferred to tea entrepreneur Weththinge Jinadasa. And it was an event that drew messages of support and congratulations from both the country’s President and Prime Minister. The team then returned to the UK four days later to host 900 students at GSM London. The three alumni networking sessions in Singapore, Beijing and Hong Kong attracted nearly 200 graduates and saw a number sign up to the new Plymouth Connect mentoring network.